Milarepa (1052-1135) was a great Tibetan Yogi who lived an austere life on the bare hillsides of the Himalayas, eking out an existence on donations and the few plants — principally nettles — that grow in that harsh environment. His name means “The Cotton-Clad One,” and he generally wore just a thin sheet, using the heat generated by meditation practices to keep the fierce Tibetan cold at bay. Despite his remote living situation he attracted many disciples and visitors, and although he belonged to no school he is particularly venerated by the Tibetan Kagyus, who trace their lineage back through him. 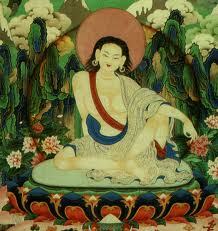 Milarepa was a master of Mahamudra, a meditation approach that emphasizes the innate purity of the mind. In his inimitable and playful style, Milarepa compares the unawakened self to a dog running after a stick that has been thrown. When it comes to chasing sticks, many dogs have more enthusiasm than sense: I remember, for example, a friend’s dogs repeatedly charging into a Scottish loch to “fetch” the stones that I was throwing into the depths. Often our own minds are scarcely less silly than those dogs. Anyone who has sat in meditation has observed this and knows exactly what Milarepa is talking about: the mind goes chasing after any and every thought that passes through it, and often doesn’t much mind whether it suffers in so doing. So much for humans being smarter than dogs. There are many possible alternatives to chasing the sticks of thought like a hapless hound. We can start chasing them and then bring the mind back to a point of focus, rather like calling a dog to heel. We can learn sit still and to watch the sticks fly past without reacting to them. We can even learn to examine the sticks and recognize their impermanence and the fact that they are not intrinsic to the mind. All of these techniques are useful, and even necessary. But Milarepa goes several steps beyond. Milarepa suggests that we turn, like a lion, and look directly at the mind itself. What can we expect to find? First, we can expect to see thoughts arising and passing away, liberating themselves without us having to exert any effort to rid the mind of them. Second, we can see the space of awareness within which these thoughts arise. That awareness is pure, and unstained by the thoughts that pass through it. That awareness is your Buddha nature, your own potential enlightenment. All thoughts arise in this stainless awareness and dissolve within it. To see the nature of those thoughts clearly, Milarepa tells us elsewhere, is to see that there never was any arising or passing away: that all thoughts are empty of self-existence and lacking in essence. Thoughts, he tells us are illusory. It’s only our delusion that makes us think of them as real, and so, over and over, we go plunging into the lake to retrieve the unretrievable. 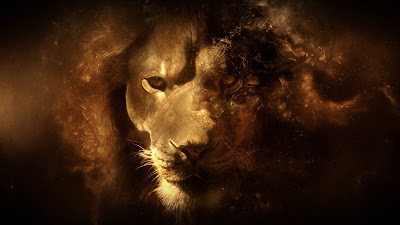 Although we tend to think of spiritual awakening as lying at the end of a long and arduous task, it’s right here, right now, just waiting for us to stop chasing sticks and instead, lion-like, to turn and look deeply into our own mind, and its thought, and to see their nature.